You’ve probably had the experience of standing in a newly decorated living space feeling like something is missing—like the room lacks a touch of pizzazz. Usually, you just shrug it off and forget about it, or maybe you buy a statement throw pillow at Urban Outfitters and call it good, or maybe you just start thinking about how much the word “pizzazz” is like a more enthusiastic version of the word “pizzas” and then next thing you know you’re out eating Korean waffle pizza with no recollection of how you got there. All of this skirts the real problem. 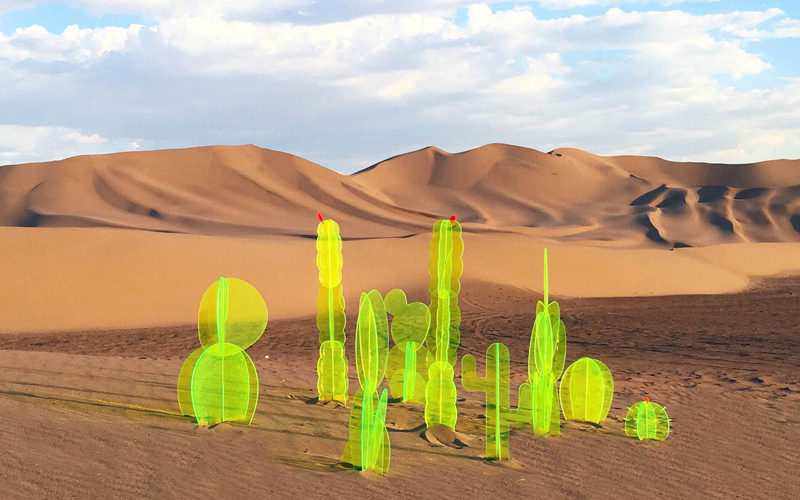 The real problem with your decor is the absence of Nobel Truong’s glowing cactus sculptures. Look at the ones below and tell me they don’t fill both the empty space on your tastefully minimal nightstand and the cactus-shaped hole in your heart. Truong, an L.A.-based designer, debuted her laser-cut acrylics at the Pop Up Flea in 2015, and her work has been cropping up in stores and galleries like Paul Smith ever since. She brings a postmodern sensibility to the tropes of mid-century design, citing Ray and Charles Eames as inspiration. A two-foot tall neon green cactus will run you about $200 (some assembly required), and the miniature versions are $35. Some just appear to glow, because that’s how fluorescent plastic works, and some actually light up. She also makes florescent acrylic furniture on which you can put your fluorescent acrylic cactuses (yes, “cactuses” because “cacti” is as pretentious as “octopi”), and it’s tasteful as all get-out.